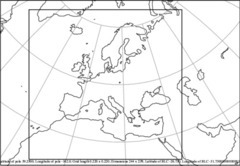 AQUM is a limited area configuration of the Met Office Unified Model (MetUM), which uses the UKCA chemistry scheme (Savage et al., 2013). AQUM uses the RAQ (Regional Air Quality) chemistry scheme, which has 40 transported species (16 emitted) plus 18 non-advected species, and has 116 gas-phase reactions and 23 photolysis reactions. For aerosols, AQUM uses the CLASSIC scheme. Operationally, AQUM runs at 12km resolution over a domain covering the UK and western Europe, producing a five day air quality forecast. AQUM version 8.3 was used, with the addition of new emissions branch to allow split between fire and anthropogenic emissions and the output of emission totals. Day-of-week and monthly-variation taken into account when producing daily gridded emissions data. Hourly variation taken into account within model for gas-phase species to allow for longitudinal-based local time variations. Hourly varying emissions from TNO, averaged to give daily gridded emissions. The model then applies diurnal cycle within its code. SO2 and NH3 emissions are inserted at level 6 (320m). PM emissions are spread 9.1625% into level 1 (20m), with the remainder spread equally into levels 2-11 (53.3-953m). 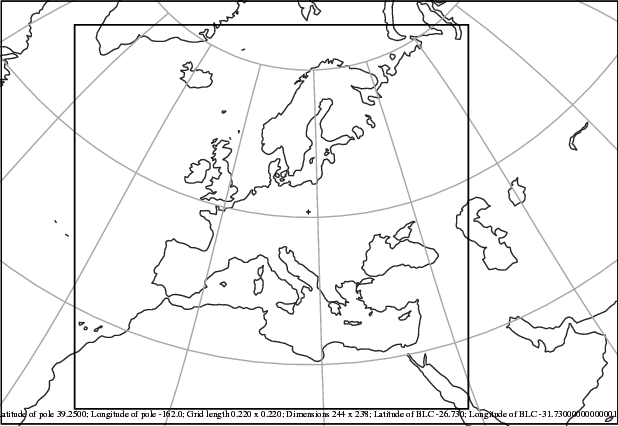 Meteorological initial and boundary conditions are provided by running a Global, meteorology-only version of the MetUM at ~60km resolution, 70 vertical levels to 80km. Boundary conditions for the regional domain are output every 6 hours. Savage N. H., Agnew P., Davis L. S., Ordóñez C., Thorpe R., Johnson C. E., O’Connor F. M. and Dalvi M. (2013), “Air quality modelling using the Met Office Unified Model (AQUM OS24-26): model description and initial evaluation”. Geosci. Model Dev.,Vol. 6, pp. 353-372, doi:10.5194/gmd-6-353-2013.